It Only Takes 15 Minutes To Clean Your Doormat! The vast majority of the dirt that enters our homes does so on foot. So we put down doormats, but what do we do when the doormats get filthy? For your doormat to continue to work as it was intended to, you'll have to keep your doormat clean! Luckily, it's very easy to clean your doormat. It only requires 15 minutes of your time and requires a mere three materials to clean it with! These three doormat cleaning materials will help you when it comes time to clean: a vacuum cleaner, a garden hose, and mild dish soap. Some people also use baking soda, a broom or a scrub brush, and a clothesline, depending on their cleaning method. Shake out the doormats when you sweep your porch or after your lawn is mowed. A good shaking will remove a lot of dust and dirt that otherwise might be tracked into your home. You can also help dislodge dirt ground into the mat by smacking the mat against an outside surface such as the sidewalk. After shaking, you can quickly vacuum the doormat to make sure all the dirt got out, whether it's a small hand-held or traditional vacuum cleaner. Doing this process weekly will help keep dirt and stains out of your doormat. MonthlyVacuum the doormats, if you haven't already, to release deeply embedded dirt that shaking alone won't always reveal. This is a good time to inspect your doormat and make sure it's still in good condition. If your doormat smells strange, you can use baking soda to get rid of the odd odor. Put some baking soda on your doormat and let it sit for ten minutes before using a scrub brush to rub the baking soda in. You can let the mat sit for about five more minutes before vacuuming for a final time this month. SeasonallyBe sure to follow your manufacturer's instructions, but many outdoor doormats can be rinsed off with a garden hose. Some tougher spots may need a tiny bit of mild dish soap. 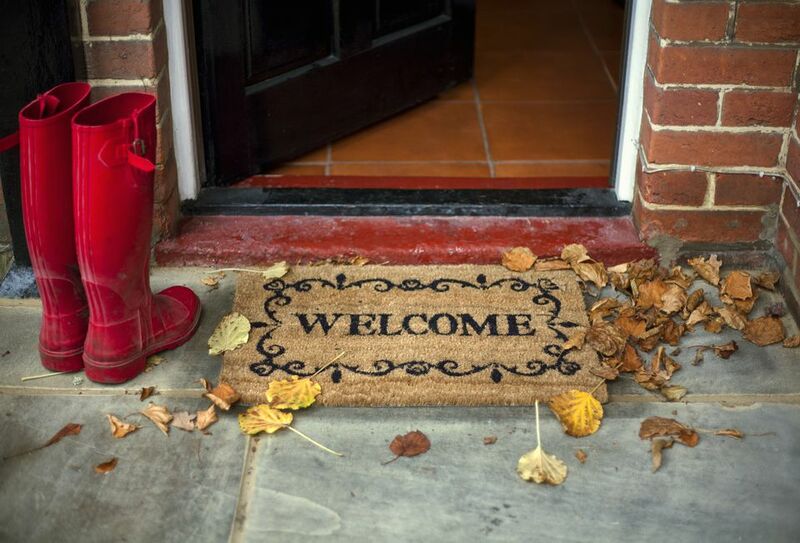 This is ideally done seasonally to get your doormat in great shape for whatever weather the next season brings based on your particular location. For example, in winter you may want to use a sturdy mat outside that doesn't hold onto moisture and prevents mold, mildew, mud, and muck. When the streets are salted, sweeping or vacuuming the salt off your doormat on a frequent basis will make sure it doesn't get into your home and ruin your floors. Always read your manufacturer's instructions to know the requirements for cleaning your doormats. Decide on a doormat that is reasonably easy to clean and takes a small amount of time to remove dirt and muck. Depending on the size of your mat, you may be spending fifteen minutes, or thirty. Choose a mat that is long enough to walk on with both shoes before going into your home.